Not just another Mount Gay edition. The story of Mount Gay Rum begins in the year 1703, on the Caribbean island of Barbados, when John Sober (seriously?!) inherited a distillery, and invited Sir John Gay to help manage it. Sir John Gay jumped at the opportunity to give the Barbadians something special. He refined the production process and began producing noticeably superior product that has survived to this day. Mount Gay is the oldest Rum brand in the World. A distillery with a 300-year tradition and Master Distiller Allen Smith at its helm. How can this expression go wrong? You’re right it cannot... and it didn’t. MGXO is a fantastic blend consisting of a wide range of sassy Rums from 7 to 15 years of age, all of which were nursed in American White Oak ex-Kentucky Bourbon barrels. MGXO’s excellence was awarded many a time (e.g. Trophy at the 2001 International Spirits Challenge in London), but even though it is very highly regarded among Rum-inados, it’s still often overlooked by noobs who look for “premium” on the label... don’t be that guy. To covet or not to covet? Hmm… not really a tough nut to crack, is it? 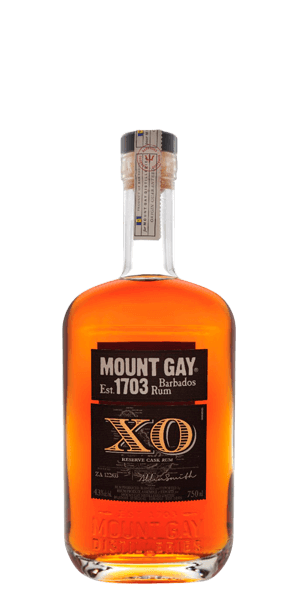 What does Mount Gay XO Reserve Cask taste like? The Flavor Spiral™ shows the most common flavors that you'll taste in Mount Gay XO Reserve Cask and gives you a chance to have a taste of it before actually tasting it. Deep and complex. Dark molasses, brown sugar, luxurious oak, cocoa, baking spices, oak, ripe fruit. Rich, tropical and dry. Molasses, apples, vanilla, toffee, ripe banana, canned & dried fruit. A punch of flavour with some biscuits & molasses. Well spiced. Takes me to an island when I taste it. One of my favorite rums. Rich complex flavors. Exceptionally smooth and balanced blend of aged rums. Superb to drink neat and delightful if mixed in a cocktail where the rum takes center stage. Has a strong fragrance. However it goes down very smooth. Great Rum mixed or not. Would buy it again. Great full body rum, very smooth. I love it on the rocks with a lime wedge. Good rum. This is basically a tropical bourbon. It's a warm summer day, you want something refreshing, you're a rum lover, a little ice, a little lime . . . and Mount Gay . . . a MUST! It's a smooth, delicious rum you don't want to waste in a mixed drink. This is a very complex rum. The mineral quality of the molasses definitely comes through, though the banana is a bit estery, not unlike the aroma of those penny candy store "balloon in a tube" novelties. If it weren't for the over-esteriness, I'd rate this quite high. That barrel aging worked out really well. There is a smoky undertone to the subtle flavors that linger on this richly bodied rum. I would not hesitate to purchase this.